While convention center and city staff will work with various conventions and trade shows to accommodate them during the expected 2016-2018 construction on the Miami Beach Convention Center, getting construction and renovations completed quickly will take priority over an individual show’s needs. At a Joint Finance and Citywide Projects/ Neighborhood/ Community Affairs Committees meeting this week, city staff presented a two-phase construction plan for the Miami Beach Convention Center that would allow for two of the total four exhibition halls to be available to conventions and trades shows during the three-year construction phase. Half the building would be under construction during phase I from 2016-2017, and the other half during phase II from 2017-2018. As the plan moves forward, city staff is working to accommodate the various conventions and trade shows during construction and maintain relationships so that when the center is renovated it doesn’t open to an empty booking calendar. In April, the city commission awarded Fentress Architects the design criteria project for the center. Fentress is helping to set parameters for conventions and shows during the construction period to ensure that construction will be done within 36 months. Limitations discussed at the committee meeting were a limit of two available halls, no (or not guaranteed) access to the parking lot and compressed load-in and load-out times that will be limited to one hall. “If you have to have four [halls] and you have to have the P-Lot and you can’t work with construction, I believe your answer today is very clear: you need to find somewhere else to go,” said Commissioner Deede Weithorn, chair of the Finance and Citywide Project committee. “We’re not adding new halls. This project does not include adding any exhibition space, it’s renovating four existing halls. There is simply no way we can renovate four halls and keep them all open at the same time,” said City Manager Jimmy Morales. Some conventions and trade shows present at the meeting like IDEA and Cruise Shipping Miami asked whether construction could be delayed in 2016 to give them more time to figure out how to work within the parameters. While an exact start for construction hasn’t been set, the city was looking at December 2015 and January 2016, Mr. Morales said. A priority list of conventions that the center and city staff may work with were polled to see if they could figure out a way to stage their events within the parameters. Only four of the 12 on the priority list said they could work within all the parameters. 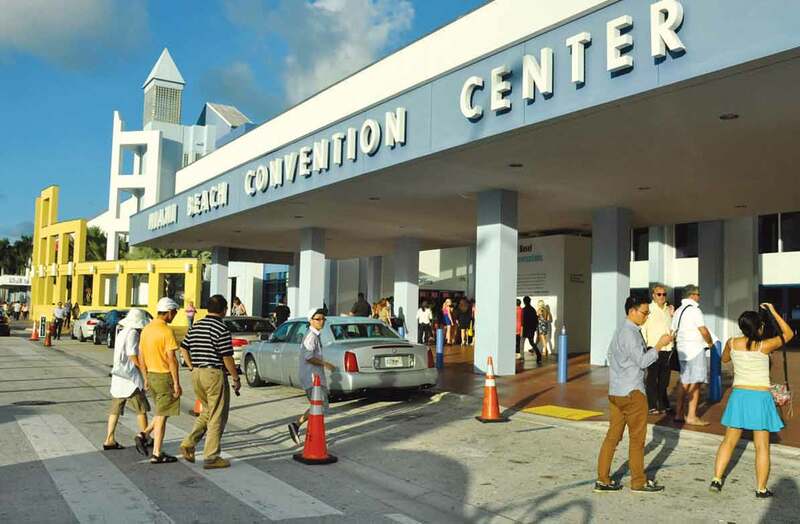 Informex, FIME International Medical Expo, the International Surface Event and Art Basel Miami Beach all agreed to the two-hall limit, no access to the P-Lot and compressed load-in and load-out times, while the International Congress of Esthetics, Cruise Shipping Miami, IDEA 2016, eMerge, Maison & Object Design Show, Miami International Pow Wow 2016, Watches and Wonders, and International Floriculture said they could not. Even if a convention or show wasn’t on the priority list presented to committee, it will still be approached by convention center and city staff to see if it could fit within the construction parameters. “We would go back to every single event, every single one regardless of whether they’re on this list, and say, ‘We have two halls for sure available. Can you fit? If you fit, we’re going to try to accommodate [you],’” said Max Sklar, city director of tourism, culture and economic development. “We will use every means possible to provide as much space as we can within the confines of moving forward… under construction,” Mr. Morales said. Losing convention business could have larger economic ramifications that affect the hotel, retail and tourism industry. In order to mitigate negative repercussions of a tight construction schedule, city staff might consider different options like pop-up tents and re-assigning parts of the parking lot to provide more space. The tight construction schedule and limitations on center use during construction are intended to wrap up what has been a long, drawn out renovation process. Renovating the center and bringing it up to date with existing technologies has long been a city priority, and plans to complete the renovations are moving ahead after the current administration earlier this year scrapped a prior agreement with South Beach ACE to upgrade the center.